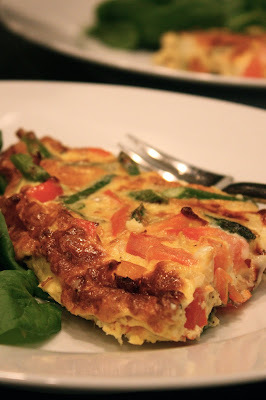 A frittata is an exceptionally versatile dish, equally suited for a holiday brunch or a light, quick and easy dinner. They are (in my opinion) much easier to prepare than an omelette, requiring less attention and less work...you can feed six people with just one frittata. Whether for a group or for two, you can have a great frittata on the table within 30 minutes, start to finish. And, just about anything works as a fixing...turkey (! ), sausage, bacon, onions, peppers, mushrooms, artichokes, potatoes, tomatoes, spinach, broccoli...you get the picture. You can just mix and match your favorite fixings to create whatever suits your palate. And, though this may not sound like an appealing quality, they are the perfect dish to prepare when you're cleaning out your fridge. I happened to have quite a bit of asparagus and asiago cheese in my fridge so I just added in some tomatoes and onions and...viola...frittata. Now...as far as I can tell (from an untrained position), there are several camps on just how you should approach the making of frittatas. 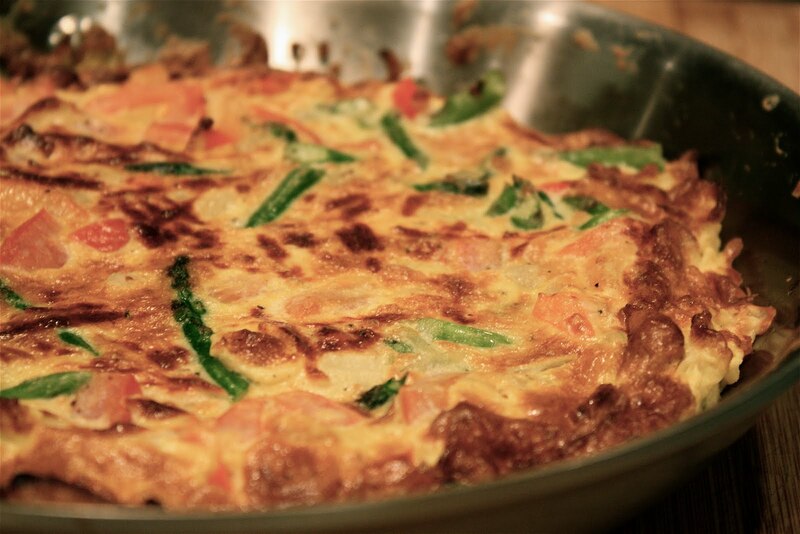 (All, of course, assume you don't use one of those pricey frittata-making pans.) The traditional way to make a more rustic-looking frittata is to use a heat-resistant skillet (something that can go on the stove and in the oven...no plastic parts). It's at this point of agreement that the camps then divide. There's one method that says stay on the stove for the whole show. Another that says stay on the stove until you get just a bit of the egg to hold, then pop it into a 350 degree Fahrenheit oven to finish it off (usually anywhere from 15 to 30 minutes, depending on how large it is). Then, there's the camp that says stay on the stove until you have a nice golden bottom and the eggs are holding well...then stick it under the broiler to finish off the top to a golden brown (about three minutes or so). In this last camp, they say that if the eggs aren't completely set when you take your frittata out, then just let it rest on a cooling rack and the residual heat will gently cook them through. Phew...that's a lot of camping. While I was in the second camp for many years, I do think it's nice to venture to other places from time to time. In real words: I liked the idea of a golden top. So I tried the third method...with a little twist. Because the eggs didn't appear to be completely set after the top was beautifully golden, I simply popped it out of the oven, switched the temp from broil to 350 degrees Fahrenheit and stuck it back in for another minute or so. I like my frittatas warm out of the oven, so the cooling rack option wasn't going to work for me. According to Cook's Illustrated (my new little go-to read), this broiling method gives your frittata a great density. They're not too flat (stove-only method) or too spongy (long oven-stay method). They're just right...puffy, golden, and good. You need at least six eggs to get a decent frittata going (for a small 10-inch skillet); a dozen for a larger 12-inch skillet. You need to cook your fixings up first, browning them a bit to pull out their flavors and reduce their moisture level before adding in your eggs. And you want a nice ratio of fixings to eggs...or you won't get much puff. 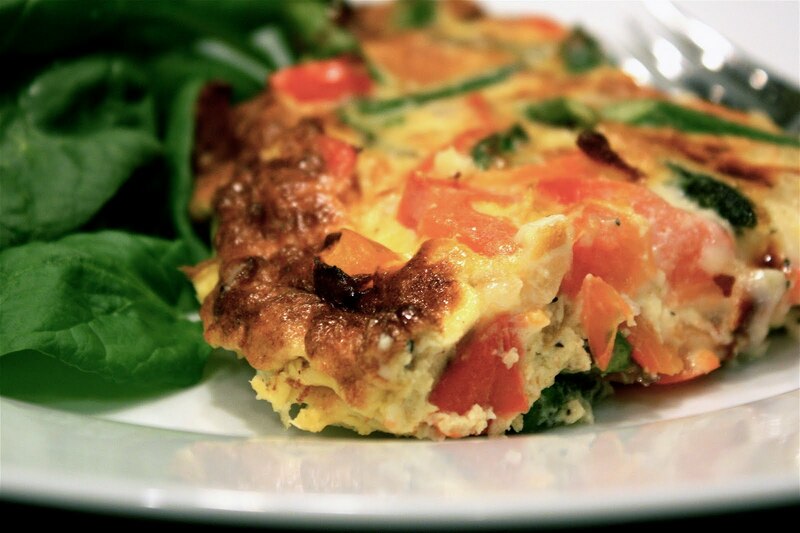 Dropping your cheese in with your eggs not only gets it beautifully incorporated into your frittata, but it doesn't then mess with the achievement of a golden brown top. You don't need to add any dairy to your eggs (though half and half was the recommended go-to if you want). Just give them a good go-over with a whisk to get a little air into them. Then...just gather your favorite fixings. 2. In a heat-resistant skillet, over medium heat, add olive oil and butter. Once butter is melted, add veggies (through onion) and cook until the onion appears soft, about 2 minutes. Add in tomatoes and cook another minute longer. Meanwhile, whisk eggs until you get just a bit of froth on them. Add cheese, salt, and pepper to eggs. Mix well and pour them over veggies in skillet. 3. Cook egg mixture on stovetop, pulling spatula through eggs (scraping bottom of pan) until large curds start to form. Tip pan slightly to allow eggs to run to sides, distribute evenly. Once eggs appear to be holding, let them cook for another 30 seconds or so (without disturbing them) until the bottom appears golden. 4. Pop skillet under broiler (4 to 5 inches from heat) for approximately 3 minutes, until it appears puffy and top is golden. Keep an eye on them while broiling in case they brown up quicker. Remove from oven. If eggs do not appear completely set, rest skillet on a cooling rack so that residual heat will gently cook eggs through. OR, switch oven from broil to 350 degrees Fahrenheit and pop skillet back in for another minute or less.